In Figure 15.44, how much work is done by the system in process AB? 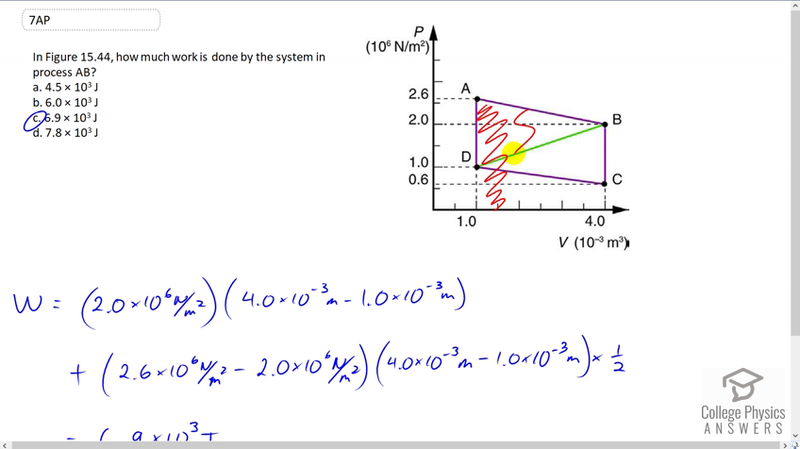 This is College Physics Answers with Shaun Dychko. The work done by the system going from A to B is the total area underneath the curve and so we need to find the area of this trapezoid. So consider it to be the area of this yellow rectangle plus the area of this blue triangle and so the work done is 2 point O times 10 to the 6 newtons per meter squared and which is the pressure at the top of this rectangle and we multiply that by the heights so to peak and then we multiply that by the width of the rectangle. So that's 4 times 10 to the minus 3 cubic meters minus 1 point O times 10 to the minus 3 cubic meters. So that’s the yellow part and then add to that the area of this triangle. So we have the difference between 2.6 and 2 each times 10 to the 6 and then we add to that the difference between 4 and 1, each multiplied by 10 to the minus 3 and then we times up by half because this is the base times the height times one half is the formula for the area of the triangle and this works out to 6.9 times tenth to the three joules. So the answer is C.